For yoga breathing, we use a technique of drawing the lower belly in throughout the exhalation. The movement should feel natural and smooth, without force. As a student progresses with this technique, they can gradually draw the belly in from the lowest point, just above the pubic bone, up to the middle/upper abdomen, and this method of breathing leads into uddhiyana and mūla bandha practice. For most new students I see, this technique is unnatural and difficult. The level of control it requires for the breath and deep musculature of the abdomen requires a lot of focus. Especially for students with anxiety, gradual movement of the belly seems entirely out reach. In fact, for many stressed or anxious students, the natural movement of the breath is reversed, with the belly expanding on exhale and drawing in on inhale. This technique can't be forced. Forcing the breath to move a way that is uncomfortable creates even more strain and stress, and can provoke symptoms of anxiety, including breathlessness, racing heart, and even feeling faint. Modifying the breath needs to be approached gradually. Begin lying down on your back, with your knees bend and feet on the floor. Support your head with a folded blanket or small pillow if you like for comfort. Place one or both hands on the lowest part of the belly, below the navel and just above the pubic bone. What do you feel in this space? Can you feel the warmth of your hand? Can you feel the weight of your hand? Just see what this space feels as you breathe naturally. Add a soft sound to each exhale, either saying "aaaah" or "mmmm" in a low, soft voice. Try to keep the volume and tone the same through the entire breath. Can you feel your belly gently sinking toward your spine when you make this sound? If so, continue making the sound as you exhale, feeling the sensation of your belly being drawn down toward the spine. If not, just concentrate on making the sound in the breath very smooth, and feel the warmth/weight of your hand on the lower belly as you breath. As the movement becomes easier to feel, and the sound in the breath is easy to sustain, I will teach students ujjayi breath. I also teach postures like apānāsana or uttānāsana to get the abdomen involved a bit more on the exhale so that the movement of the breath becomes linked with the movement of forward bending of the spine. Especially in private lessons, I try not to bring students' attention to the movement of the belly until I can see that it's happening, or the exercise creates more stress! Why do we prefer this breathing pattern? There are a few reasons we use the exhale technique in yoga, as it improves breath capacity, improves lengthening in the lower back for forward bending poses and moves the apāna vayu region to help eliminate waste. For me, one of the biggest benefits is the feeling of stability and groundedness that comes from the technique, since it gives students a feeling of being strong and calm. As the deepest muscles of the core become firmly engaged by the end of the breath cycle, students have greater stability and a foundation they can lift or extend from safely. Drawing the lower abdomen also aids movement of lower digestive organs, promotes health and function of reproductive tissues in the abdomen and pelvis, and it stabilizes pelvic floor muscles and soft tissue. In yogic anatomy (also called subtle anatomy), there is an idea that undigested food and experience sits like dirt (mala) in the lower abdomen, and that the action of drawing the abdomen up brings the dirt up to the digestive fire (agni) of the stomach. This stoking of our fire, improves our vitality and enables us to process and eliminate the stuff that's been around too long. There is some science, too, that attempts to validate the experience. Bottom line is, being able to engage and utilize the abdomen during the exhale opens a lot of doors for an effective practice. It's such a valuable tool, that I designed the entire Beginning Yoga class around practicing and experiencing it. It takes regular practice at an appropriate level over time to develop this pattern so that it is subtle and done without force. One of my teachers, Dolphi Wertebecker, describes the breath as wild and skittish, like a feral kitten. You need to move gently and help it to trust you as you work with it. How does it work for you? Have you tried it? How do you feel when you use it? I am leading an informal online Yogasūtra Chat on Friday mornings. Each week, I post a short video introducing the yoga sutras by chanting them and giving a brief translation and explanation. Here are links to the videos--you will also find links to the handouts in the video description. (The first two videos were created on Facebook. I am looking into downloading or re-recording them to post on Youtube). The first chapter of Patanjali's Yogasūtra introduces the topic of yoga, defining elements of practice, the activities of the mind, and the result of practice. Sutra 1 - 4: What is yoga? And what is the result of practice? Sutra 5 - 11: What are the activities of the mind? Sutra 12 - 16: What does yoga practice consist of? Sutra 17 - 22: How does yoga practice lead to self-realization? Videos and handouts will be added here each week right after class. You can comment on the video itself, or join us on Patreon for discussion (I post these videos to the Patron-only feed). I hope you enjoy this resource and find it useful in your studies! 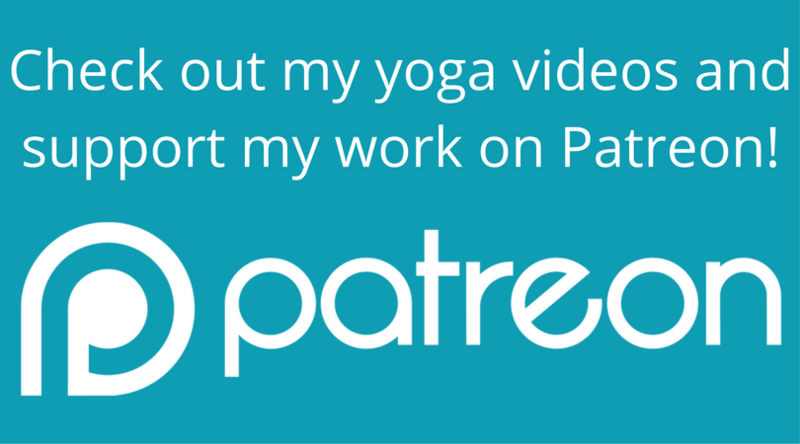 If you find these videos useful, check out my free Monday Meditations and Wednesday Ask a Yoga Teacher videos on Patreon. Why do we use Ujjayi breath? Most new yoga students are surprised by how much I talk about the breath during class. In fact, I probably give more directions for your breath than your body in a typical group class. Our ability to control our breath is one of the most powerful tools we have in yoga practice. Consider the vital role that breath plays in our body--its influence is everywhere! What's very cool about yoga is that a long time ago, people realized they could change how they feel and how their minds and bodies work by changing their breathing patterns. Notice your breath as you imagine being surprised, excited, relaxed, angry or sad. It changes a lot. One of the things we might do in yoga is breathe in a relaxed way, and that way of breathing persuades the other parts of your system that you are relaxed. And then you really are relaxed. It's a little more complicated than that, and we spend a lot of time talking about and practicing this stuff in teacher training, but that's the gist of how it works. There is a great deal of utility in manipulating the breath if you know what you're doing. And learning something like ujjayi breath is a perfect start to yoga breathing practices. Breathe in through your nose, and as you exhale, whisper "ahhhhhh" a few times. As you make the whisper sound, listen to it. See how smooth you can make the sound and see if it can last the entire length of your exhale. Then, close your mouth and see if you can still make the same whisper sound as you breathe out through your nose. That's really all there is to it. You may also be able to add the whisper sound to the inhale right away, but in my experience, the inhale is a bit trickier to work with for new students. I suggest sticking to exhale only for a week or so and add the inhale as it becomes easy. If you prefer to listen and practice, I have a recording all about ujjayi breath here. Creating a noise gives your breath a sound and a feeling that makes it easier to notice and control. Something as subtle as air becomes more tangible, and it's more satisfying to work with and focus on, especially for beginning students. The sound and sensation also give students something to focus on. You can't tell someone to clear their mind and expect them to successfully keep their mind empty and still. Our minds don't work that way. They need something to do. And focusing on creating and listening to a sound in the breath is a nice little challenge to keep the mind engaged. As the student advances, his breath grows more soft and subtle, so that even ujjayi breath is barely audible. One of primary elements of ujjayi breath is that the sound or sensation created should become entirely smooth and require almost no effort. You'll notice in the beginning that the volume may change throughout the length of your exhale, or the breath may sputter or break up a bit. But as you become more proficient, you'll be able to maintain a very smooth sound even during movement and in more challenging breathing practices. A break or unevenness in the breath is an indication that you are working beyond the level of effort that's useful or desirable in yoga. Most of the systems we are working with in yoga are highly refined, and they don't welcome forceful disruptions. Listening to the breath and staying at a level where the breath is smooth keeps your yoga practice healthy and effective. To create the whisper-like sound in your breath, your throat needs to gently constrict a bit. And this constriction slows the stream of air that passes through, in the same way that a drink flows more slowly through a narrow straw than through a wide one. I won't spend a lot of time on it here, but one of the main ways that we influence the breath in yoga is by using different ratios for the inhale and exhale. A inhale that is longer than the exhale is excitatory, and can produce anxiety, so I don't use it in yoga class. An exhale that is longer than the inhale, on the other hand, tends to have a very relaxing influence. I use that one a lot. Creating the sound with ujjayi breath gives students the ability to more precisely control the stream of air as it leaves or enters. So if I ask them to breathe in for 6 counts and out for 12, they have more capability of controlling the breath. There you have it: three very good reasons to practice ujjayi breath. If you're curious, the word ujjayi is in Sanskrit, the ancient language of India, and comes from the root "ud," which means up. The entire word means something like "one who is moving up," and in the case of yoga studies, one who is advancing or becoming enlightened. You may have heard your teacher refer to ujjayi breath as victorious breath or ocean breath as well. We yogis are quite fond of this tool and give it many names! Enjoy your breathing! As I always say (not really, but perhaps I should), "Breathing every day keeps the doctor away!" The chakras are usually described as wheels or vortices of energy, spinning with the flow of life energy (prana) through the human body. 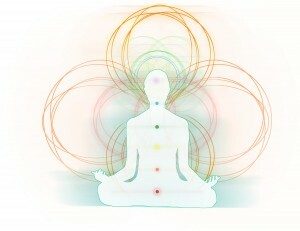 There are traditionally seven chakras which run from the base of the spine to the crown of the head. During the early Western interest in yogic practices, scientists attempted to locate the chakras within the body, and many posited that the chakras directly correlated with the plexuses of the nervous system. Today, however, the chakras are generally considered to be without physical, tangible form. Although research is still being done to determine whether the chakras have any quantifiable effects on the body or response to external stimuli, most yogis agree that the chakras are primarily a tool for meditation and personal development. The locations of the seven primary chakras are determined by the paths of the nadis, or energy currents. The nadis begin at the base of the spine and weave their way upward to meet at the crown of the head, and their points of intersection are the location of the chakras. Defined by colors, sounds, shapes and elements (among other symbols), the chakras represent the full spectrum of our experience of life, from our most basic human needs to the highest reaches of our consciousness. The Muladhara chakra is located at the base of spine, and is connected to the feet, legs and pelvic floor. Its element is Earth, and it represents man’s relationship to the material world and his basic physical needs. Located in the pelvic basin, svadhisthana is symbolized by the element of water. It relates to the sexual organs and represents man’s sexuality, creativity and joy. Manipura is found around the navel or solar plexus region, and its location connects it to the digestive system and metabolism. Symbolized by fire, manipura represents willpower, confidence and energy. Its location at the heart center connects anahata to the experience of complex emotions, including love and compassion. It is symbolized by the element air, and it is related to the function of the lungs and immune system. Vishudda is located in the throat area and represents the expression of self, honesty and learning. It is related to speech and its element is ether. Located at the center of the brow, the ajna chakra is related to the brain and pituitary gland, the “master gland” which regulates endocrine function in the body. Ajna represents intuition, imagination and inner guidance. Resting at the crown of the head, beyond all material elements, sahasrara represents man’s connection with the divine and his enlightenment. or imagined from promises in scriptures. In the opening scene of the Bhagavad Gita, Arjuna, greatest warrior among men, looks across the battlefield before the great war of the Mahabharata. The Kuru and Pandava clans both hold claim to the highest kingdom on earth; they are cousins, and have gathered men from all corners of the kingdom to fight in this epic war. Arjuna is preparing to fight men who have been friends and family–he knows many are virtuous, courageous and wise, and he struggles with his duty as a warrior to fight them. Arjuna asks himself how there can be glory in sacrificing his kin for the sake of his family’s reinstatement to the throne. Krishna, the embodiment of God, speaks to Arjuna of his duty (dharma), telling him that the soul is immortal and that attachment to one’s own state of living, or to another’s, is selfish and fruitless as the attachment to material objects. And if that attachment causes man to ignore his dharma, he cannot find honor, because he has lost the path of righteousness; and he cannot find peace, because all earthly matter is transient and will eventually fade or change. Non-attachment is a practice that begins with distinguishing between that part of us which is eternal, and those things which are extraneous and transitory. Recognition of this difference then allows us to avoid a feeling of personal loss or pain when things change or don’t go as planned. We see that the true Self remains whole and untouched, and we can find peace in its permanence. Yoga teaches us non-attachment through its various practices. In asana practice, we are encouraged to work at a level appropriate to our personal ability, and not to push or strain ourselves past that level. We also learn in challenging poses to disassociate ourselves from physical discomfort so that we remain relaxed. In pranayama and meditation we relinquish attachment to the active thoughts, the worries or preoccupations we usually face, in order to maintain stillness in the mind. We learn to become disinterested in the final results, to momentarily let go of future goals and obligations and limit our awareness to the present moment. Do thy work in the peace of Yoga and, free from selfish desires, be not moved in success or failure. Yoga is evenness of mind—a peace that is ever the same. The Bhagavad Gita teaches that we have the right to our actions, but not to the fruit of those actions. Since we cannot control the activity of other beings or matter in the world, we cannot control whether our actions will prove successful. To form expectations, or to become attached to an outcome, is a futile and often disheartening exercise. Although the concept of acting without the promise of any return for our labor can be hard to accept, non-attachment is crucial to finding peace in life. We cannot escape work and action, and if we let our happiness be subject to the potential results of our work, we risk disappointment. When I contemplate the philosophy of non-attachment, I’m reminded of R.K. Narayan’s novel, The Vendor of Sweets. The story centers around Jagan, owner of a sweet shop in India, a pious, conservative, hard-working man. His son Mali has disappointed him by leaving for America, wasting his money, and returning a few years later with an American wife. Mali returns to ask Jagan to invest his savings in an unethical business venture. When Jagan refuses, the rift between him and his son widens, and Mali becomes untrustworthy, stealing money from the sweet shop, and disrespectful. Jagan is deeply troubled by his son’s actions and choices, and his worry leads to depression. Eventually, he learns that his unhappiness was caused not by Mali, but by his own attachments to Mali’s behavior and prosperity. Jagan chooses to retire to a temple, breaking all ties with his former life. Having renounced his attachments, Jagan finds true peace at last. It makes sense that attachment to material objects which fade with time could be the source of much unhappiness in a lifetime. It is perhaps more challenging to accept that our peace depends on action without attachment to the results. What motive have we to act, unless it is to secure a specific outcome? According to theGita, to fulfill our dharma, or our duty in life, is the only motive for pure, unattached action. All other action is motivated by self-interest, and will likely lead to unnecessary suffering. Studies estimate that 75-90% of visits to primary care physicians are for disorders caused by or linked to stress. While the workplace is the most common source of stress for American adults (up to 40% say their job is very or extremely stressful), causes of chronic stress abound for adults, adolescents and children, and can include major life changes, financial problems, demands of family or children, and issues like violence and threats to personal safety, environmental pressures leading to substance abuse or other unhealthy lifestyle habits, and social isolation or loneliness. You’ve likely experienced the effects of stress on your health first-hand–perhaps you’ve gotten a cold easier when working against a difficult deadline at work, or craved sugary, carbohydrate-rich foods at the end of a stressful day. These subtle signs of an unhealthful stress response may not have been enough to have prompted you to change in the habits, decisions and relationships which contribute to your stress. You should know that the harmful effects of chronic stress are real, and they have been shown to lead to diseases such as obesity, diabetes, autoimmune disorders, depression, substance abuse, and cardiovascular disease. Chronic stress disrupts the homeostatic relationship between the hypothalamus, pituitary gland and adrenal glands, often referred to as the HPA Axis, and excites the sympathetic nervous system (SNS). A stressful experience triggers the release of cortisol by the HPA axis and epinephrine/nor-epinephrine (aka, adrenaline/noradrenaline) by the SNS, which initiates a cascade response within the body. The function of this stress response is to prepare the body for “fight or flight” by mobilizing stored energy, directing blood flow to major muscle groups in the arms and legs and sensitizing tissues to hormones and neurotransmitters, enabling us to respond quickly and effectively when faced with a threatening situation. The physiological effects of stress. Cortisol helps to produce an excitatory state by increasing heart rate, blood pressure and blood glucose levels, and increasing the sensitivity of body tissues to hormones and neurotransmitters, ensuring that the muscles have plenty of oxygen and energy and respond immediately. Epinephrine and norepinephrine increase heart rate and also increase blood viscosity to promote clotting in case of injury. Over time, increased blood pressure, heart rate and clotting can fatigue the heart, potentially leading to heart disease. Chronically increased blood glucose levels can lead to tissue damage throughout the body and precipitates diabetes. Decreased insulin levels can lead to increased hunger, fat storage and weight gain. In small amounts cortisol increases anti-inflammatory activity to speed recovery, but when elevated, it weakens the immune system and decreases anti-inflammatory activity to prevent the body from overreacting to foreign bodies or disease when resources need to be reserved for reacting to the stressor. In order to suppress the immune system, cortisol activates the increased production of tryptophan pyrrolase, the enzyme which initiates the irreversible breakdown of tryptophan. Tryptophan is required by the body for the manufacture of both serotonin and melatonin—when stores are depleted, both serotonin and melatonin levels plummet. Reduced levels of these neurotransmitters have been linked to many symptoms of depression. Chronic overstimulation of the HPA axis and the disruption of hormones and neurotransmitters within the body can lead to dysfunction in any or all of the systems involved. For instance, the adrenal glands may be fatigued by continuous stimulation during periods of physical or emotional stress, and in that state are no longer capable of a healthy response. This can lead to exhaustion, poor immune response and depression. The stress response system exists so that we can respond to immediate stressors, such as predators and other life-threatening situations; once the stressor is removed, HPA axis and SNS activity is reduced and the body returns to homeostasis. However, situations of chronic stress lead to continuous activity of the HPA axis and SNS, which causes systemic imbalance, and ultimately can promote physiological disorders such as diabetes, osteoporosis, heart disease and autoimmune disease and psychological disorders including depression, anxiety, alcoholism and eating disorders. Find out why many health professionals are recommending yoga to reduce stress and to help alleviate its harmful effects in How Yoga Relieves Stress. McCall, Timothy (2007). Yoga as Medicine: the yogic prescription for health and healing. New York: Bantam Books. Moffett, John R., and MA Aryan Naboodiri (2003). “Tryptophan and the immune response.” Immunology and Cell Biology, 81, 247-265. Ross, A., & Thomas, S (2010). “The health benefits of yoga and exercise: A review of comparison studies.” The Journal of Alternative and Complementary Medicine, 16, 3-12. Walton, Kenneth G., and Debra Levitsky (1995). “A Neuroendocrine Mechanism for the Reduction of Drug Use and Addictions by Transcendental Meditation.” In Self-Recovery: Treating Addictions Using Transcendental Meditation and Maharishi Ayurveda, Vol. I, by David F. O’Connell and Charles N. Alexander, 89-117. Binghamton, NY: Haworth Press, Inc. In addition to these physiological effects, yoga has also been shown to decrease anxiety, relieve symptoms of depression, and increase feelings of emotional, social and spiritual well-being. So science has confirmed what yogis have known for centuries: yoga reduces stress. But how does it work? The traditional system of hatha yoga, as described in Patanjali’s Yoga Sutras, is composed of eight limbs of yoga. These eight limbs are the practices which lead a yogi on his path to enlightenment. Guidelines for living, the yamas and niyamas, direct a practitioner in his behavior and thought. The yamas include compassion, honesty, non-stealing, self-control, and non-greed. The niyamas include cleanliness, contentment, discipline, self study, and recognition of a higher power. Living by these guidelines helps avoid the complications that dishonesty and lack of self-control bring about, as well as the negative thought patterns that lead to judgment, discontent and greed. By adopting an attitude of compassion for ourselves and all beings, we gain balance and peace of mind. Physical postures, or asanas, promote strength, balance, flexibility, and the optimal functioning of the human body. Many poses directly calm the sympathetic nervous system. Forward bending poses which squeeze the abdomen against the thighs momentarily increase perceived blood volume and pressure, and the body responds by dilating blood vessels and decreasing the heart’s pumping volume to lower blood pressure. Slight prone backbends which put pressure on the abdomen (like bhujangasana, or cobra pose) have a similar affect. Heart-opening poses that place pressure on the adrenals mildly stimulate them, which can be helpful if chronic overstimulation of the HPA Axis has led to their dysfunction or fatigue. Other restorative poses, such as savasana (corpse pose) or viparita karani (legs-up-the-wall pose) allow the skeletal muscles to relax completely, releasing physical tension. Breath control, or pranayama, can stimulate or calm the nervous system in addition to focusing the mind. While poor or abnormal breathing patterns can chronically overstimulate the autonomic nervous system (leading to anxiety or fatigue), deep and even breaths engage the diaphragm and induce a calming effect. In particular, inhaling and exhaling at a 1:2 ratio (in which the exhale is twice as long as the inhale), increases oxygen and decreases carbon dioxide in the body—this increase of oxygen is picked up by receptors in the brain stem and the aortic and carotid sinuses and initiates the body’s relaxation response by slowing the heart rate and reducing blood pressure. Non-attachment, referred to as pratyahara, or withdrawal of the senses, is the practice of detaching one’s mind from external objects and occurrences. While practicing non-attachment, we may be aware of the object, but we control the mind’s focus to keep it from engaging with the object. This prevents us from becoming personally affected by what arises outside and allows us to maintain inner peace. Meditation comprises the final three limbs: dharana, immovable concentration of the mind; dhyana, meditation on the profound or divine; and finally samadhi, union with the divine, to the degree that the concept of self dissolves as the practitioner becomes one with the universe. Meditation and deep relaxation practices quiet the mind and body and enhance the practitioner’s awareness of his entire being (corporeal as well as psychological and spiritual). In a typical group yoga class, students practice postures and breathing, and often meditation. These three exercises alone can activate the body’s relaxation response and quiet the mind. The other limbs, especially the guidelines for living (yamas and niyamas) and the practice of non-attachment cultivate a peaceful presence that you can carry into all areas of your life, on and off the yoga mat. This state of peace is a foundation from which you can respond to situations in a healthful, objective and effective manner, instead of allowing them or their consequences to overwhelm. “Blood Pressure Reduction.” Alternative Medicine and Rehabilitation: A Guide for Practitioners. Wainapel SF, Fast A, editors. New York: Demos Medical Publishing; 2003.